There’s no way to prepare for becoming a dad. The first few months will inevitably be a challenge–you’ll be exhausted, confused, and nervous. Matt Coyne, author of MAN VS. BABY, has been there and done that. In the excerpt below, he shares his advice for all first-time dads. Remember, you got this! 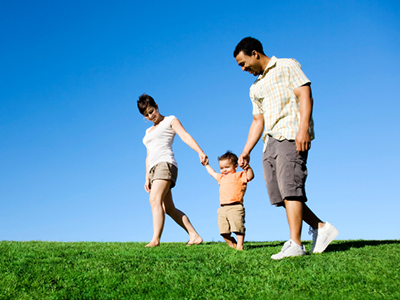 Parenthood is one of the greatest gifts and you’ll become a natural before you know it. I am not great parent material. I am forgetful, frequently dim, and something of an inept and clueless fuckup. And so, for these reasons and a thousand others, becoming a parent hit me like a hammer made of hammers. In my defense, I think the reality of being a parent for the first time comes as a shock to most people. Everybody tells you it’s going to be hard, so it really shouldn’t come as any great surprise when it is. But that jolt comes anyway: because it is hard. A friend of ours sent us a note when Charlie was born. It said that our lives were about to change forever, and to prepare for a “gear change.” And becoming a parent for the first time is a gear change—a seriously grinding, metal-on-metal, shrieking gear change. And in the beginning it feels less like changing gears and more like the car you are in has plunged off a cliff, rolled several times, and then burst into flames before coming to a stop halfway up a tree. For those first few months you are just as much an infant as the one you brought home from the hospital. You have to learn a new language and new skills, and adjust to a new world that bears no resemblance to the old one. And no allowances are made for the fact that you are also a baby, disoriented and confused. No allowance is made for how unready you might be. There is no slow-learners class (like that class at school for those kids who weren’t ready for scissors); you just have to keep up, and keeping up can be tough. But human beings, even ones as pathetically ill-equipped as I am, are resourceful and smart. Our capacity for change is an evolutionary birthday cake. And once you learn some of the basics, adjust to your new reality, and ascertain that you can’t actually die from a lack of sleep (I mean, you can, but you probably won’t), you do what humans have done for millennia: you adapt. Maybe you even begin to get the hang of it. Make no mistake, after those initial months, it still remains hard, exhausting, confusing, and all those things. But slowly, as the weeks and months pass, you realize something: the moments that are terrible are getting shorter and the moments of joy are getting longer. Until, one day, you start to feel like a parent, and less like you want to drink lighter fluid, run into the wilderness, and never ever look back. Matt Coyne also shares the expectations vs. reality of becoming a dad. Excerpted from Man vs. Baby by Matt Coyne. Copyright © 2018 by Matt Coyne. Used by permission of the publisher. All rights reserved. One evening, while his three-month-old son Charlie briefly slept, Matt Coyne staggered to his desk, opened his laptop, and wrote a side-splittingly funny Facebook post about early fatherhood: Comparing his diaper-changing skills to that of a Formula One pit crew, birth to a Saw movie, and the sound of a baby crying at 3am to “having the inside of your skill sandpapered by an angry Viking,” he shared his observations with friends and family—and soon, to his surprise, the world. 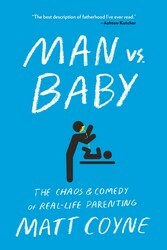 In the spirit of that post, which became an instant sensation, Man vs. Baby is the tale of one man’s journey through the first year of parenthood, told with wit, humor, and heart. Part memoir, part tell-it-like-it-is parenting book, this is a ferociously funny, inventively foul-mouthed, and genuinely touching account of a baby’s first year, filled with relatable references to Harry Potter, McDonalds, and the villain in Die Hard.